ORLANDO, Fla. - Firearms are slowly becoming a costly problem in the United States. With firearm injuries on the rise, the cost of medical care and recovery also increases. News 6 decided to examine some of these expenses to determine the financial impact of being shot. Right now, gun-related homicides are on the rise, and in turn the use of firearms. According to the World Health Organization, U.S. gun-related homicides are 25 times higher compared to other high-income countries. As a notable and wealthy country, the cost of getting shot is also expensive here. A number of studies have been conducted to learn the average cost of gun violence in America. According to a Johns Hopkins study published in 2017, firearm-related injuries account for $2.8 billion in inpatient and emergency care each year. This number is drawn from an analysis of inpatient bills from 2009 to 2013. This study revealed firearm injuries were higher among men than women -- particularly in the 20 to 24 year-old age range. It also showed that men are almost five times more likely to have a gun-related death compared to women. Emergency department charges also average out to be $5,254 -- this number stems from their sample of about 705,000 people across the country. Out of this same sample, researchers learned inpatient charges average annually to be $95,887. That means gunshot wounds and gun-related injuries could amount to $100,000 in hospital costs a year. Note that most insurance companies do cover recovery and emergency costs. Coverage varies patient to patient, according to their insurance policy and coverage plans. The people most devastatingly affected are those without health insurance. Though there are a number of variables when determining the precise cost of suffering a gun-related injury, generalizations have been drawn based off of medical care costs. Generally speaking, getting shot in the lower extremities increases chance of survival but could also be life-changing. The cost of care becomes more complicated. For example, getting shot in the calf means the victim will likely survive. Medical care, though, could involve a wheelchair, physical therapy to learn how to walk again, a cast or walker, even if this care is temporary. It depends on the extent of injury. Multiple studies published between 1972-2016 outline where on the body a gunshot wound could do the most damage. For simplicity, News 6 has narrowed down these categories into four parts. A firearm injury to the head, face or neck tend to be deadly. It isn’t a commonly survivable injury -- and if the victim does survive, initial costs of care land around $10,000. That price includes X-rays of the skull or even surgery to remove a bullet. The most survivable firearm injuries tend to be gunshot wounds to the shoulder, arm, hand, thigh, calf or foot. That means below the neck and below the waist tend to be the most survivable of firearm injuries. According to Orlando Medical Regional Pricing Transparency Guide, the cost of care when shot anywhere in the arm could range from $600 to $3,000. That includes multiple X-rays, shoulder strapping, or removing something from one’s arm, similar to an easy-to-remove bullet. Suffering a shot to any part of the leg is also highly survivable, but the injury could cause more bodily trauma. If a victim suffers multiple gunshot wounds to the thigh or foot, they could be placed in a cast or required to use a walker or wheelchair. At the very least, crutches may be necessary for a period of time as the wound heals. Worst case scenario can include physical or occupational therapy, or distress to the muscles. A study on the cost of gunshot wounds also factors in emotional distress. It points out that injuries to the lower extremities tend to cause more emotional distress because of the life-altering effects a gunshot wound could have. For example, causing paralysis or loss of a limb. Firearm injuries to the head are the most deadly, but following second are firearm injuries to the middle part of one’s body. That includes the chest, abdomen, back and lungs. A bullet puncturing a lung could involve a $7,247 procedure. A shot to the heart could lead to death. Paralysis is more likely if a bullet comes in close contact -- or lands -- on one’s spine. Surgery is more likely to be involved when suffering a gunshot wound to any of these areas. For perspective, an X-ray to the chest and ribs starts at about $500 at ORMC. Then there’s initial observation care, which is $110. If the victim doesn’t die, they’re already looking at a $600 bill -- and counting. Ultimately, the extent of injury depends on the bullet. Some people survive gunshot wounds that on the surface may seem deadly, yet others die from gunshot wounds that appear to be relatively minor. It depends on location, with the trajectory determining the severity of injury. According to previous numbers, a gunshot wound can cost anywhere between $100 to $9,594. A huge portion of financial strain when suffering a gunshot wound is getting medical care at a hospital. If the victim suffers an injury that requires them to take an ambulance, they could see a charge anywhere between $700 to $1,000. Ambulances, by practice, are required to take a victim to the closest and most available hospital -- to rush patients to care as quickly as possible. Distance can be a factor when determining ambulance costs. ORMC reports per mile costs. A patient is charged approximately $22 for each mile the ambulance drives heading toward a hospital. The extent of injury could also increase the cost. On ORMC’s cost transparency chart, it cost around $5,324 to activate the emergency department trauma team. If the victim is arriving to the hospital via helicopter, they are looking at $14,930 bill. Air mileage runs at $35 a mile. Just getting to the hospital can put one in debt, and these costs are not always covered by insurance. 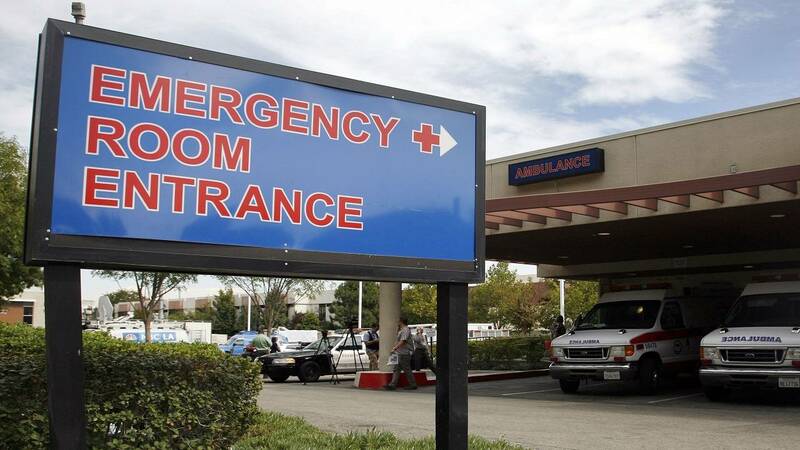 ORMC lists an emergency department visit costs at $1,313. This number fluctuates patient to patient, but when discussing the severity of a gunshot wound, this number is likely closer to the estimated cost a victim would face. According to the aforementioned study, the average hospital stay with a severe gunshot wound is about six days. ORMC does not provide the cost of per night stays due to the varying costs. They do, however, provide the cost of intermediate ICU room and care. That’s about $4,108. As mentioned, firearm injuries are slowly becoming a more frequent problem, and it’s costing the country. A total estimated hospitalization cost for injuries from firearms from 2006-2014 is $6.6 billion nationwide. Dividing that cost by the nation’s population in 2014, and accounting for inflation, it would cost each person in the U.S. about $254 to pay off the $6.6 billion nationwide hospital bill. U.S. government agencies also have a formula to place a dollar value on life. The U.S. Office of Management and Budget has multiple methods that look at how much money, time and comfort people routinely pay for safety. They’ve learned that people pay an average of $250 to reduce their risk of death by a 1 in 10,000 chance. The U.S. government implies that it values loss of an anonymous life at $2.5 million. That’s how much the government assumes someone’s life is worth, even they die by a random firearm injury. The Costs of Gunshot and Cut/Stab Wounds study from 1993 uses the government’s methods to learn it costs $3.4 million per gun murder or unintentional death. They also learned the U.S. values death by firearm suicide at $2.4 million. Keep in mind, in 2015 only about 17 percent of injury deaths were caused by firearms. The cost average per gunshot survivor is about $154,000 in the U.S. The average funeral cost in Florida is around $7,279 with medical expenses associated with death averaging around $12,000. In many scenarios, surviving a gun-related injury could cost as much as dying. For perspective, guns can run as cheap as $250 -- but their damage could cost 10 times more.